With so much time and attention given to the glorious biceps, it’s surprising that there has been no real conclusive research to determine which is the most effective exercise for targeting the biceps. So the American Council on Exercise, America’s Workout Watchdog, commissioned the exercise scientists at the University of Wisconsin—LaCrosse and its Clinical Exercise Physiology program to find an answer. Young, now a graduate student at UWLAX, would help shepherd the study along under the guidance of department head John Porcari, Ph.D. 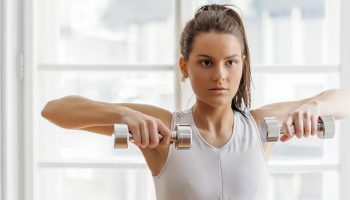 The Concentration Curl was significantly better than anything else, the reason being that one is really isolating the biceps muscle more than in any of the other exercises. 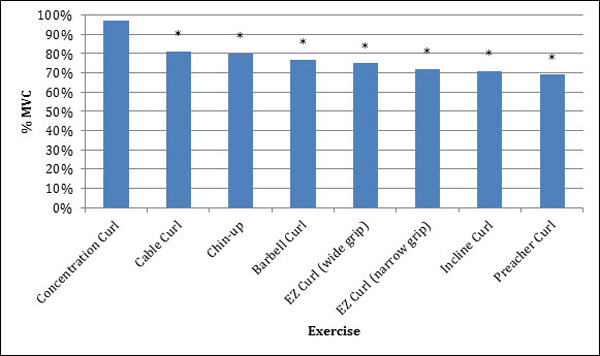 Not only did the current study show that the concentration curl had the greatest biceps activation, but that the activation of the anterior deltoid (AD) was significantly less than most of the other exercises. This may be because during a concentration curl, the humerus is pressed against the leg and does not allow the upper arm to sway, which isolates the biceps. Dumbbell concentration curls is an excellent isolation exercise that mainly targets the biceps, brachialis, and brachioradialis. Sit on the end of a flat bench with your legs apart and lean slightly forward. d.
Grab a dumbbell in one hand with your palm facing upward (underhand grip) and rest your elbow on the inside of your thigh letting the dumbbell hang. Slowly curl the weight up while keeping your elbow locked in place against your thigh. As you are curling the dumbbell up, twist your wrist to the outside (supinate). Squeeze the muscle at the top of the movement for a one-count and then slowly return to the starting position. Repeat 8-10 number of repetitions. So if you’re bodybuilder, or a lover of the mirror, and you want to really work your biceps, then there’s one clear choice: the concentration curl. But if you want to strengthen your biceps and other muscles of the arm for functional fitness, to make yourself better at the everyday movements we encounter in daily life, then you have more options. For sure, every arm workout should include the concentration curl, but the best way to ensure that you activate other key muscles of the arms is to sprinkle a couple of the other seven biceps exercises into your routine as well.